I bought everything I used to decorate Jace's blue elephant nursery theme on the internet. I focused not only on finding just the right elephant baby bedding, decorations and gear, but getting just the right combination of items in the shades of baby blue (that stayed in line with the color scheme of the baby's bedding) that would be attractive with the nursery's wall color and the existing brown floor covering. 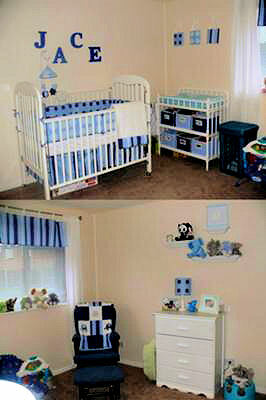 As you can see from the pictures of my baby boy's elephant nursery, we were successful. The patchwork throw on the glider mimics the squares of the baby blue and navy blue storage bins on the shelves under the baby's changing table as well as the shapes of the three hanging fabric wall decorations and the sky blue lamp shade with royal blue squares. Even Jace's wooden wall letters are painted in the same varying shades of blue. We hung wall shelves over the baby's dresser and alternated blue and brown elephant toys in decreasing sizes to add some brown decorations to the walls of the elephant nursery pulled from the color of the carpet. To keep our elephant baby nursery light and airy we used semi-sheer white window treatments topped off with a blue striped valance that closely matches the fabric in one of the patchwork squares in the throw you see decorating the nursery glider. I think our elephant baby nursery turned out pretty good considering that I didn't see any of the decorative items in person before buying them. Everything in the baby's room was ordered online from different stores and different companies. I am so fortunate that everything worked together so beautifully and hope that visitors that come here to find the best Unique Baby Gear Ideas and Nursery Themes will agree! I loved your nursery so much that I am doing a blue elephant nursery with geometric accents. This is the one that I plan to use. for my baby boy's room. It is modern but has the traditional colors that my husband insisted that we had to go with. Join in and write your own page! It's easy to do. How? 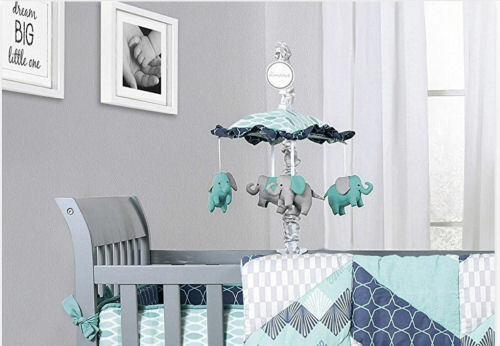 Simply click here to return to BABY ELEPHANT NURSERY PICTURES and DECORATING IDEAS.